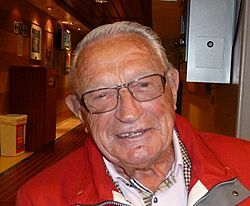 Hjalmar Johan "Hjallis" Andersen (March 12, 1923 – March 27, 2013) was a Norwegian speed skater. He won three gold medals at the 1952 Winter Olympic Games in Oslo, Norway. He was the only triple gold medalist at the 1952 Winter Olympics, the most successful athlete there. Andersen was born on March 12, 1923 in Rødøy, Norway. He was married to Gerd Andersen until her death in 2003. They had three children. Andersen fell in his home on March 25, 2013. He was unconscious until he died two days later on March 27, 2013, aged 90. Hjalmar Andersen Facts for Kids. Kiddle Encyclopedia.